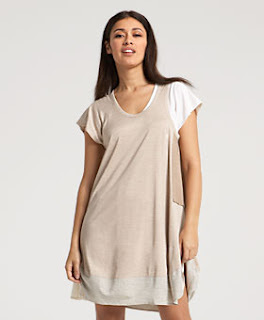 Much like the ubiquitous trapeze dress this spring, T-shirt dresses have a superloose shape, are incredibly comfortable, and enable you to eat whatever you want without suffering from tight waistband syndrome. 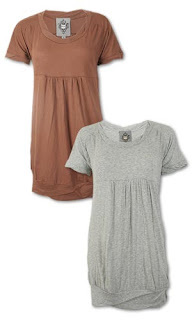 But unlike trapeze dresses, I think these tee-inspired styles are more appropriate for weekend wear. 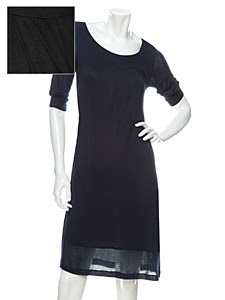 I think much of the T-shirt dress trend can be attributed to Marc Jacobs' breezy, easygoing spring collection, which included many layered jersey beauties like this tunic dress with tank detail. Expensive, yes, but exquisitely detailed. Another runway look that you're sure to see on many stylish ladies this season is this 3.1 Philip Lim Rosette dress--it's sold out everywhere in white, but I actually prefer the black--it's more durable (I have an impossible time keeping white clean) and you can probably get at least three seasons' worth of wear from it. And one more runway look is this asymmetrically shirred striped dress from Peter Som. It has a bit more shape to it than many of this kind, and as long as it's not skintight, it has the potential to be incredibly flattering. The most affordable dress Miu Miu has made in years, this oversized T-shirt dress doesn't even look like a tee, and the drop-waist shape will last you well into fall, when the '20s flapper silhouette will really take hold. 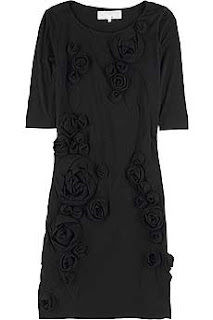 Less fussy than the last Philip Lim dress and more affordable than the Marc Jacobs, this draped tunic dress, also from 3.1, is supershort, but long on style. A sexier take on the trend, Bread and Butter's jersey dress has a low back and a more clingy fit. 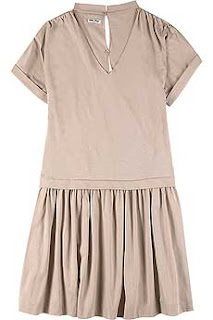 The funny thing is, as simple as the T-shirt dress appears, it hasn't filtered down to the lower-priced stores yet. So this MK2K jersey scoopneck dress isn't a super-bargain, but it looks comfy and the empire-waist seam gives it a nice bit of structure. 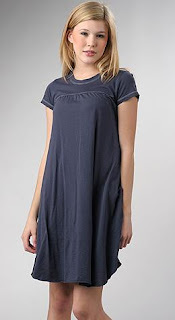 I feel like you can't go wrong with this jersey dress from Splendid--they make some of the softest tees, and the V-neckline gives it a universally flattering shape.